Shell Diversity & Inclusion storytelling. Shell International wanted to increase awareness and understanding of the challenges faced by transgender employees, as part of its commitment to continually improve diversity and inclusion across the company. As a longstanding supplier of internal communications to Shell with an established track record for compelling and effective storytelling, Headlines was commissioned to develop a personal story focusing on a transgender employee and her colleagues. We worked with the internal communication and diversity & inclusion teams to develop the objectives for the story. We then conducted all research and interviews, wrote the extended feature and gained copy approval and images from all stakeholders. 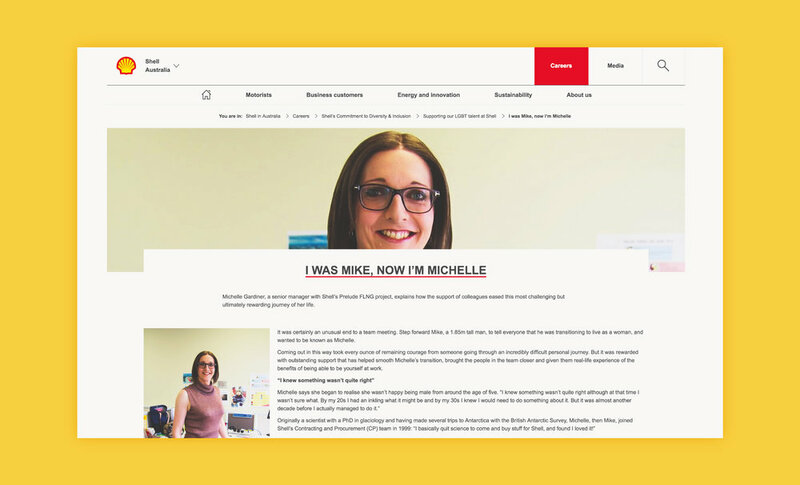 The feature, titled I was Mike, now I’m Michelle, remains one of the most ‘liked’ and commented-on stories published to date on Shell’s global news portal. The view rate was more than 45,000 (over half of Shell’s employees) and the effectiveness metrics placed it in the top quartile. It was subsequently published externally on Shell’s website and was shortlisted for Best Feature in the 2016 UK Institute of Internal Communication (IoIC) awards. <strong>Dixons Carphone</strong>How we helped content creators nail their editorial.